Sudan (Arabic: السودان‎ as-Sūdān or ;), officially the Republic of the Sudan (Arabic: جمهورية السودان‎ Jumhūrīyat as-Sūdān), is an Arab republic in the Nile Valley of North Africa, bordered by Egypt to the north, the Red Sea, Eritrea and Ethiopia to the east, South Sudan to the south, the Central African Republic to the southwest, Chad to the west and Libya to the northwest. It is the third largest country in Africa. The Nile River divides the country into eastern and western halves. Its predominant religion is Islam. Sudan was home to numerous ancient civilizations, such as the Kingdom of Kush, Kerma, Nobatia, Alodia, Makuria, Meroë and others, most of which flourished along the Nile River. During the predynastic period Nubia and Nagadan Upper Egypt were identical, simultaneously evolved systems of pharaonic kingship by 3300 BC. By virtue of its proximity to Egypt, the Sudan participated in the wider history of the Near East inasmuch as it was Christianized by the 6th century, and Islamized in the 7th. As a result of Christianization, the Old Nubian language stands as the oldest recorded Nilo-Saharan language (earliest records dating to the 9th century). Sudan was the largest country in Africa and the Arab world until 2011, when South Sudan separated into an independent country, following an independence referendum. Sudan is now the third largest country in Africa (after Algeria and the Democratic Republic of the Congo) and also the third largest country in the Arab world (after Algeria and Saudi Arabia). Brown, Richard P.C. (1992) Public Debt and Private Wealth: debt, capital flight and the IMF in Sudan. Macmillan Publishers London ISBN 0-333-57543-1. Churchill, Winston (1899; 2000). The River War — An Historical Account of the Reconquest of the Soudan. Carroll & Graf Publishers (New York City). ISBN 978-0-7867-0751-5. Clammer, Paul (2005). Sudan — The Bradt Travel Guide. Bradt Travel Guides (Chalfont St. Peter); Globe Pequot Press. (Guilford, Connecticut). ISBN 978-1-84162-114-2. Jok, Jok Madut (2007). Sudan — Race, Religion and Violence. Oneworld Publications (Oxford). ISBN 978-1-85168-366-6. Mwakikagile, Godfrey (2001). Slavery in Mauritania and Sudan — The State Against Blacks, in The Modern African State — Quest for Transformation. Nova Science Publishers (Huntington, New York). ISBN 978-1-56072-936-5. Prunier, Gérard (2005). Darfur — The Ambiguous Genocide. Cornell University Press (Ithaca, New York). ISBN 978-0-8014-4450-0. Welsby, Derek A. (2002). The Medieval Kingdoms of Nubia — Pagans, Christians and Muslims Along the Middle Nile. British Museum Press (London). ISBN 978-0-7141-1947-2. Zilfū, ʻIṣmat Ḥasan (translation: Clark, Peter) (1980). Karari — The Sudanese Account of the Battle of Omdurman. Frederick Warne & Co (London). ISBN 978-0-7232-2677-2. ^ "Sudan: States, Major Cities, Towns & Agglomeration – Statistics & Maps on City Population". City Population. 2011. Retrieved 12 May 2012. ^ a b "2005 constitution in English". Retrieved 31 May 2013. ^ "Republic of the Sudan Bureau of Statistics". cbs.gov.sd. 2014. Retrieved 1 October 2014. ^ a b "Sudan". International Monetary Fund. Retrieved 1 October 2014. ^ a b c d e f g h i "The World Factbook: Sudan". U.S. Central Intelligence Agency. ^ a b Keita, S.O.Y. (1993). "Studies and Comments on Ancient Egyptian Biological Relationships". History in Africa 20: 129–54. ^ Roux, Georges (27 August 1992). Ancient Iraq. Penguin Books Limited. ^ Metz, Helen C. (1991). Sudan: a Country Study. Washington: GPO for the Library of Congress. pp. "The Coming of Islam". ^ Domke, D. Michelle (November 1997). "ICE Case Studies; Case Number: 3; Case Identifier: Sudan; Case Name: Civil War in the Sudan: Resources or Religion?". ^ "Factbox — Sudan's President Omar Hassan al-Bashir". ^ Bekele, Yilma (12 July 2008). "Chickens Are Coming Home To Roost!". ^ Kepel, Gilles (2002). Jihad: The Trail of Political Islam. Harvard University Press. p. 181. ^ Walker, Peter (14 July 2008). 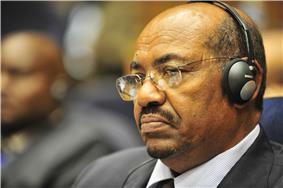 "Profile: Omar al-Bashir". The Guardian (London). Retrieved 13 January 2011. ^ Shahzad, Syed Saleem (23 February 2002). "Bin Laden Uses Iraq To Plot New Attacks". ^ Victims Sue Sudan for $105 Million"Cole"Families of USS . Fox News. Associated Press. 13 March 2007. Retrieved 14 January 2011. ^ Fuller, Graham E. (2004). The Future of Political Islam. Palgrave Macmillan. p. 111. ^ Wright, Lawrence (8 August 2006). The Looming Tower. Knopf Doubleday Publishing Group. pp. 221–223. ^ Ali, Wasil (12 May 2008). "Sudanese Islamist Opposition Leader Denies Link with Darfur Rebels". Sudan Tribune (Paris). Retrieved 31 May 2013. ^ "ICC Prosecutor Presents Case Against Sudanese President, Hassan Ahmad al Bashir, for Genocide, Crimes Against Humanity and War Crimes in Darfur" (Press release). ^ "UNMIS Media Monitoring Report". United Nations Mission in Sudan. 4 January 2006. Archived from the original on 21 March 2006. ^ "Restraint Plea to Sudan and Chad". Al Jazeera English. Agence France-Presse. 27 December 2005. Archived from the original on 12 March 2008. ^ "Sudan, Chad Agree To Stop Fighting". China Daily (Beijing). Associated Press. 4 May 2007. ^ "UN: Situation in Sudan could deteriorate if flooding continues". ^ "Sudan — Geography & Environment". ^ "Sudan — Environment". Encyclopedia of the Nations. n.d. Retrieved 13 January 2011. ^ Hamilton, Rebecca (13 August 2010). "In Challenge to Sudanese Ruling Party, Student Activists Rally for Democracy". ^ Mazen, Maram (31 March 2010). "Sudan's Ruling Party Rigged Upcoming Vote, Crisis Group Says". Businessweek (New York). Retrieved 8 January 2011. ^ Butty, James (1 April 2010). "Yasir Arman's Sudan Expert Says Yasir Arman's Withdrawal from Election Significant". ^ "Chaotic Sudan Count Open to Manipulation — Observers". Reuters. 10 May 2010. Retrieved 4 June 2013. ^ "Sudanese woman sentenced to stoning death over adultery claims". ^ "Sudanese woman who married a non-Muslim sentenced to death". ^ "Field Listing — Legal System". ^ Goodman, Peter S. (23 December 2004). "China Invests Heavily In Sudan's Oil Industry — Beijing Supplies Arms Used on Villagers". The Washington Post. Retrieved 31 May 2013. ^ "Sudan supports Moroccan sovereignty over Southern Provinces". Morocco Times (Casablanca). 26 December 2005. Archived from the original on 26 February 2006. ^ "Darfur Peace Talks To Resume in Abuja on Tuesday: AU". ^ "Hundreds Killed in Attacks in Eastern Chad — U.N. Agency Says Sudanese Militia Destroyed Villages". The Washington Post. Associated Press. 11 April 2007. Retrieved 14 January 2011. ^ "Sudan". International Organization for Migration. 2 May 2013. Retrieved 31 May 2013. ^ "The Sudans". Gatineau, Quebec: Canadian International Development Agency. 29 January 2013. Retrieved 31 May 2013. ^ Staff writer (April 2001). "Sudan: Nearly 2 Million Dead as a Result of the World's Longest Running Civil War" at the Wayback Machine (archived December 10, 2004). U.S. Committee for Refugees. Archived 10 December 2004 on the Internet Archive. ^ "SUDAN: CSI highlights 'slavery and manifestations of racism'". IRIN. September 2001. ^ "Sudanese Authorities Urged Not to Introduce 'Censorship Bureau'"
^ "Letter to the U.N. Security Council on Sudan Sanctions and Civilian Protection in Darfur". ^ "Darfur Tops U.S. List of Worst Human Rights Abuses". USA Today (Washington DC). Associated Press. 6 March 2007. Retrieved 8 January 2011. 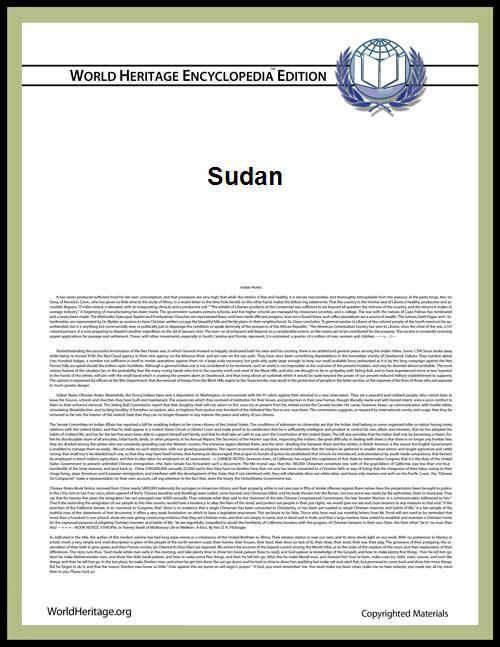 ^ "Sudan – Report 2006". ^ "Memorial of the Government of Sudan". The Hague: Permanent Court of Arbitration. 18 December 2008. p. xii. ^ "South Sudan ready to declare independence" (Press release). Menas Associates. 8 July 2011. Retrieved 4 June 2013. ^ DfID Sudan: "Operational Plan 2011-2015"
^ Richard P. C. Brown (1992). Public Debt and Private Wealth: Debt, Capital Flight and the Imf in Sudan. Macmillan Press. ^ "The "Big 4" – How oil revenues are connected to Khartoum". Amnesty International USA. Retrieved 14 March 2009. ^ Herbst, Moira (14 March 2008). "Oil for China, Guns for Darfur". Businessweek (New York). Retrieved 14 March 2009. ^ Trivett, Vincent (8 July 2011). "Oil-Rich South Sudan Has Hours To Choose Between North Sudan, China And The U.S.". Business Insider (New York). Retrieved 9 July 2011. ^ Corruption Perceptions Index 2013. Full table and rankings. Transparency International. Retrieved: 4 December 2013. ^ Welthungerhilfe, IFPRI, and Concern Worldwide: 2013 Global Hunger Index - The challenge of hunger: Building Resilience to Achieve Food and Nutrition Security. Bonn, Washington D. C., Dublin. October 2013. ^ """The 2013 Human Development Report – "The Rise of the South: Human Progress in a Diverse World. ^ "Sudan:Population living below $1.25 PPP per day (%)". undp.org. Retrieved 1 January 2014. ^ a b "World Refugee Survey 2008". ^ Suliman, Osman (2010). The Darfur Conflict: Geography or Institutions?. Taylor & Francis. p. 115. ^ Royal Anthropological Institute of Great Britain and Ireland (1888). Journal of the Royal Anthropological Institute of Great Britain and Ireland 17. p. 16. Retrieved 8 May 2011. ^ "Sudan Overview". UNDP Sudan. Retrieved 20 June 2012. ^ Leclerc, Jacques. """L'aménagement linguistique dans le monde, "Soudan (in French). Trésor de la langue française au Québec. Retrieved 31 May 2013. ^ "Hamilton, A. and Hudson, J. (2014) Bribery and Identity: Evidence from Sudan. Bath Economic Research Papers, No 21/14"
The literacy rate is 70.2% of total population, male: 79.6%, female: 60.8%. Education in Sudan is free and compulsory for children aged 6 to 13 years. Primary education consists of eight years, followed by three years of secondary education. The former educational ladder 6 + 3 + 3 was changed in 1990. The primary language at all levels is Arabic. Schools are concentrated in urban areas; many in the West have been damaged or destroyed by years of civil war. In 2001 the World Bank estimated that primary enrollment was 46 percent of eligible pupils and 21 percent of secondary students. Enrollment varies widely, falling below 20 percent in some provinces. 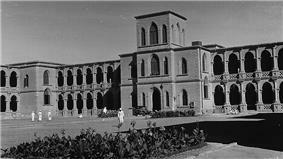 Sudan has 19 universities; instruction is primarily in Arabic. Education at the secondary and university levels has been seriously hampered by the requirement that most males perform military service before completing their education. A similar garment common to Sudan is the thobe or thawb. Like the jalabiya, the thawb is a long, tunic-like garment, although it may have a collar, be less loose-fitting, or have shorter sleeves or length than the jalabiya. The word "thawb" means "garment" in Arabic, and the thawb itself is the traditional Arab dress for men, although the word may also refer to similar tunic-like garments worn by women. Sudanese football teams such as Al-Hilal and El-Merreikh are among the nation's strongest teams. Other teams like Khartoum, El-Neel, Al-Nidal El-Nahud and Hay-Al Arab, are also starting to grow in popularity. The most popular sports in Sudan are athletics (track and field) and football. Though not as successful as football, handball, basketball, and volleyball are also popular in Sudan. Sudan has a rich and unique musical culture that has been through chronic instability and repression during the modern history of Sudan. Beginning with the imposition of strict sharia law in 1989, many of the country's most prominent poets, like Mahjoub Sharif, were imprisoned while others, like Mohammed el Amin (returned to Sudan in the mid 1990s) and Mohammed Wardi (returned to Sudan 2003), fled to Cairo. Traditional music suffered too, with traditional Zār ceremonies being interrupted and drums confiscated . At the same time, however, the European militaries contributed to the development of Sudanese music by introducing new instruments and styles; military bands, especially the Scottish bagpipes, were renowned, and set traditional music to military march music. The march March Shulkawi No 1, is an example, set to the sounds of the Shilluk. The Niger-Congo family is represented by many of the Kordofanian languages, and Indo-European by Domari (Gypsy) and English. Historically, Old Nubian, Greek, and Coptic (Egyptian) were the languages of Christian Nubia, while Meroitic was the language of the Kingdom of Kush, which conquered Egypt. Sudanese Arabic is the most widely spoken language in the country. It is the variety of Arabic, an Afro-Asiatic language of the Semitic branch, that is spoken throughout northern Sudan. The dialect has borrowed much vocabulary from local Nilo-Saharan languages (Nuba, Fur, Zagawa, (languages)). This has resulted in a variety of Arabic that is unique to Sudan, reflecting the way in which the country has been influenced by Nilotic, Arab, and western cultures. 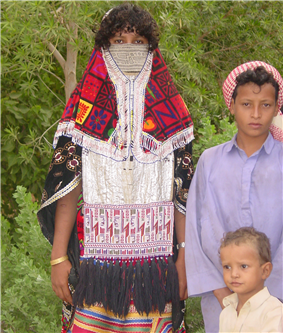 Few nomads in Sudan still have similar accents to the ones in Saudi Arabia. Other important languages include Beja (AKA Bedawi) along the Red Sea, with perhaps 2 million speakers. It is the only language from the Afro-Asiatic family's Cushitic branch that is today spoken in the territory. Significant but long-established groups of Coptic Orthodox and Greek Orthodox Christians exist in Khartoum and other northern cities. Ethiopian and Eritrean Orthodox communities also exist in Khartoum and eastern Sudan, largely made up of refugees and migrants from the past few decades. The largest groups affiliated with Western Christian denominations are Roman Catholic and Anglican. Other Christian groups with smaller followings in the country include the Africa Inland Church, the Armenian Apostolic Church, the Sudan Church of Christ, the Sudan Interior Church, Jehovah's Witnesses, the Sudan Pentecostal Church, the Sudan Evangelical Presbyterian Church (in the North). The government's actions against the Nuba people, traditional inhabitants of the mineral-rich Nuba Mountains, have been labeled ethnic cleansing. At the 2011 division which split off South Sudan, over 97% of the population in the remaining Sudan adheres to Islam. Muslims are divided between two groups Sufi and Salafi (Ansar Al Sunnah) Muslim. Two popular divisions, the Ansar and the Khatmia, are associated with the opposition Umma and Democratic Unionist Parties, respectively. In common with much of the rest of the Arab world, the gradual process of Arabization in Sudan following these Arabian migrations after the 12th century led to the predominance of the Arabic language and aspects of Arab culture, leading to the shift among a majority of Sudanese today to an Arab ethnic identity. This process was furthered both by the spread of Islam and an emigration to Sudan of ethnic Arabs from the Arabian Peninsula, and their intermarriage with the Arabized indigenous peoples of the country. 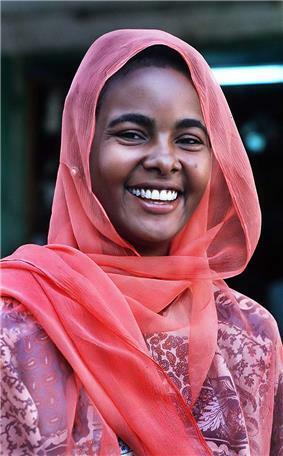 Sudanese Arabs of Northern and Eastern parts descend primarily from migrants from the Arabian Peninsula and some of the pre-existing indigenous populations of Sudan, especially the Nubian people, who also share a common history with Egypt. Additionally, a few pre-Islamic Arabian tribes existed in Sudan from earlier migrations into the region from Western Arabia, although most Arabs in Sudan are dated from migrations after the 12th century. The majority of Arabized and indigenous tribes like the Fur, Zaghawa, Masalit and some Baggara ethnic groups, who speak Chadian Arabic, show less cultural integration because of cultural, linguistic and genealogical variations with other Arab and Arabized tribes. Sudan has 597 groups that speak over 400 different languages and dialects. Sudanese Arabs are by far the largest ethnic group in Sudan. They are almost entirely Muslims; while the majority speak Sudanese Arabic, some other Arab tribes speak different Arabic dialects like Awadia and Fadnia tribes and Bani Arak tribes who speak Najdi Arabic; and Rufa'a, Bani Hassan, Al-Ashraf, Kinanah and Rashaida who speak Hejazi Arabic. In addition, the Western province comprises various ethnic groups, while a few Arab Bedouin of the northern Rizeigat and others who speak Sudanese Arabic share the same culture and backgrounds of the Sudanese Arabs. The Corruptions Perception Index has indicated Sudan as one of the most corrupt nations in the world. According to the Global Hunger Index of 2013, Sudan has an GHI indicator value of 27.0 indicating that the nation has an 'Alarming Hunger Situation' and earning the nation the distinction of being the 5th hungriest nation in the world. According to the 2013 Human Development Index (HDI) Sudan ranked the 171st place in Human Development, indicating Sudan still has one of the lowest human development in the world. Almost one-fifth of Sudan's population lives below the international poverty line which means living on less than US$1.25 per day. Oil was Sudan's main export, with production increasing dramatically during the late 2000s, in the years before South Sudan gained independence in July 2011. With rising oil revenues, the Sudanese economy was booming, with a growth rate of about nine percent in 2007. Sustained growth was expected the next year in 2008 because of not only increasing oil production, but also to the boost of hydroelectricity (annual electricity yield of 5.5 TWh) provided by the Merowe Dam. The independence of oil-rich South Sudan, however, placed most major oilfields out of the Sudanese government's direct control. In order to export oil, South Sudan must rely on a pipeline to Port Sudan on Sudan's Red Sea coast, as South Sudan itself is landlocked, as well as on Sudan's superior refinery infrastructure. 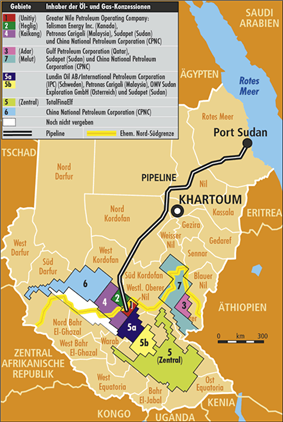 The exact terms of a revenue-splitting agreement between Juba and Khartoum have yet to be established, but Sudan will likely receive a significant portion of the income from South Sudan's oil sales as a fee for the use of Sudanese pipelines, refineries, and port facilities, perhaps as much as 50 percent of the profits. In 1999, Sudan began exporting crude oil and in the last quarter of 1999, recorded its first trade surplus. Increased oil production (the current production is about 520,000 barrels per day (83,000 m3/d)) revived light industry, and expanded export processing zones helped sustain gross domestic product (GDP) growth at 6.1 percent in 2003. These gains, along with improvements to monetary policy, have stabilized the exchange rate. The People's Republic of China is a major trading partner, and owns a 40 percent share in the Greater Nile Petroleum Operating Company. The country also sells Sudan small arms, which have been used in military operations such as the conflicts in Darfur and South Kordofan. While historically agriculture remains the main source of income and employment hiring of over 80 percent of Sudanese, and makes up a third of the economic sector, oil production drove most of Sudan's post-2000 growth. Currently, the International Monetary Fund IMF is working hand in hand with Khartoum government to implement sound macroeconomic policies.This follows a turbulent period in the 1980s when debt-ridden Sudan's relations with the IMF and World Bank soured, culminating in its eventual suspension from the IMF. The program has been in place since the early 1990s, and also work-out exchange rate and reserve of foreign exchange. Since 1997, Sudan has been implementing the macroeconomic reforms recommended by the International Monetary Fund. In 2010, Sudan was considered the 17th-fastest-growing economy in the world and the rapid development of the country largely from oil profits even when facing international sanctions was noted by The New York Times in a 2006 article. Over a four-year period to 2014, the Sudanese government's budget was yearly on the order of £140M, while UKAid provided £30M to £54M per annum. Because of the secession of South Sudan, which contained over 80 percent of Sudan's oilfields, the economic forecast for Sudan in 2011 and beyond is uncertain. Political map of Sudan. The Hala'ib Triangle has been under Egyptian administration since 2000. Muslims who convert to Christianity can face the death penalty for apostasy, see Persecution of Christians in Sudan and the death sentence against Mariam Yahia Ibrahim Ishag (who actually was raised as Christian). According to a 2013 UNICEF report, 88% of women in Sudan had undergone female genital mutilation. Sudan's Personal Status law on marriage has been criticized for restricting women's rights and allowing child marriage. Even though most of the international organizations are substantially concentrated in both South Sudan and Khartoum, the capital. It is mainly funded by the European Union and recently opened more vocational training. The Canadian International Development Agency is operating largely in northern Sudan. Since Sudan has experienced civil war for many years, many Non-Governmental Organisations (NGOs) are also involved in humanitarian efforts to help internally displaced people. The NGOs are working in every corner of Sudan, especially in the southern part and western parts. During the civil war, international nongovernmental organizations such as the Red Cross were operating mostly in the south but based in the capital Khartoum. 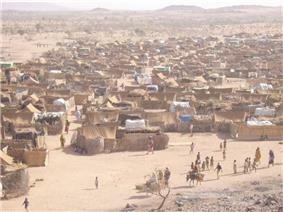 The attention of NGOs shifted shortly after the war broke out in the western part of the Sudan known as Darfur. The most visible organization in South Sudan is the Operation Lifeline Sudan (OLS) consortium. The Sudan People's Armed Forces is the regular forces of Sudan and is divided into five branches; the Sudanese Army, Sudanese Navy (including the Marine Corps), Sudanese Air Force, Border Patrol and the Internal Affairs Defense Force, totalling about 200,000 troops. 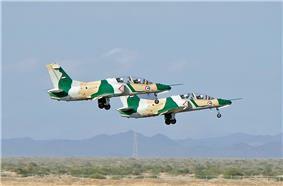 The military of Sudan has become a well-equipped fighting force, thanks to increasing local production of heavy and advanced arms. These forces are under the command of the National Assembly and its strategic principles include defending Sudan's external borders and preserve internal security. International Court of Justice jurisdiction is accepted, though with reservations. Under the terms of the Naivasha Agreement, Islamic law did not apply in the south. Since the secession of South Sudan there is some uncertainty as to whether Sharia law will now apply to the non-Muslim minorities present in Sudan, especially because of contradictory statements by al-Bashir on the matter. Stoning remains a legal form of judicial punishment in Sudan. Between 2009 and 2012, several women were sentenced to death by stoning. Flogging also remains a legal form of punishment. Between 2009 and 2014, many people were sentenced to 40-100 lashes. Sudan's public order law allows police officers to publicly whip women who are accused of public indecency. The legal system in Sudan is based on Islamic Sharia law. 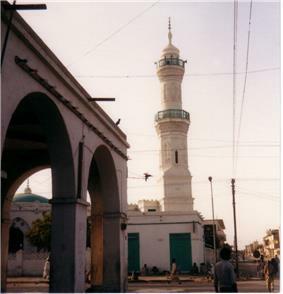 Islamic law is implemented in all of Sudan. The 2005 Naivasha Agreement, ending the civil war between north and south Sudan, established some protections for non-Muslims in Khartoum. Despite his international arrest warrant, al-Bashir was a candidate in the 2010 Sudanese presidential election, the first democratic election with multiple political parties participating in twenty-four years. In the build-up to the vote, Sudanese pro-democracy activists say they faced intimidation by the government and the International Crisis Group reported that the ruling party had gerrymandered electoral districts. A few days before the vote, the main opposition candidate, Yasir Arman from the SPLM, withdrew from the race. The U.S.-based Carter Center, which helped monitor the elections, described the vote tabulation process as "highly chaotic, non-transparent and vulnerable to electoral manipulation." Al-Bashir was declared the winner of the election with sixty-eight percent of the vote. According to the new 2005 constitution, the bicameral National Legislature is the official Sudanese parliament and is divided between two chambers—the National Assembly, a lower house with 450 seats, and the Council of States, an upper house with 50 seats. Thus the parliament consists of 500 appointed members altogether, where all are indirectly elected by state legislatures to serve six-year terms. In 1993, Sudan was transformed into an Islamic authoritarian single-party state as al-Bashir abolished the Revolutionary Command Council and created the National Islamic Front (NIF) with a new parliament and government obtained solely by members of the NIF. At the same time, the structure of regional administration was replaced by the creation of twenty-six states, each headed by a governor, thus making Sudan a federal republic. However, following the Second Sudanese Civil War (1983–2005) and the now-low-scale war in Darfur, Sudan is widely recognized as an authoritarian state where all effective political power is obtained by President Omar al-Bashir and the ruling National Congress Party (NCP). Officially, the politics of Sudan takes place in the framework of a federal presidential representative democratic republic, where the President of Sudan is head of state, head of government and commander-in-chief of the Sudan People's Armed Forces in a multi-party system. Legislative power is vested in both the government and the bicameral parliament—the National Legislature, with its National Assembly (lower chamber) and the Council of States (upper chamber). The judiciary is independent and obtained by the Constitutional Court. The amount of rainfall increases towards the south. The central and the northern part have extremely dry desert areas such as the Nubian Desert to the northeast and the Bayuda Desert to the east; in the south there are swamps and rainforest. Sudan’s rainy season lasts for about three months (July to September) in the north, and up to six months (June to November) in the south. The dry regions are plagued by sandstorms, known as haboob, which can completely block out the sun. In the northern and western semi-desert areas, people rely on the scant rainfall for basic agriculture and many are nomadic, travelling with their herds of sheep and camels. Nearer the River Nile, there are well-irrigated farms growing cash crops. The sunshine duration is very high all over the country but especially in deserts where it could soar to over 4,000 h per year. Sudan is situated in northern Africa, with a 853 km (530 mi) coastline bordering the Red Sea. It has land borders with Egypt, Eritrea, Ethiopia, South Sudan, the Central African Republic, Chad, and Libya. With an area of 1,886,068 km2 (728,215 sq mi), it is the third largest country on the continent (after Algeria and Democratic Republic of the Congo) and the sixteenth largest in the world. 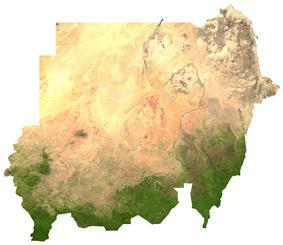 Sudan lies between latitudes 8° and 23°N. In July 2007 the country was hit by flooding, with over 400,000 people being directly affected. Since 2009, a series of ongoing conflicts between rival nomadic tribes in Sudan and South Sudan have resulted in a large number of casualties. 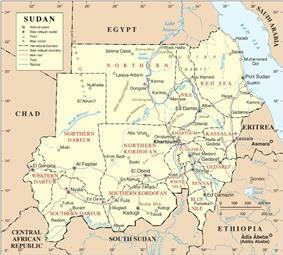 The Sudan internal conflict in the early 2010s between the Army of Sudan and the Sudan Revolutionary Front started as a dispute over the oil-rich region of Abyei in the months leading up to South Sudanese independence, though it is also related to the nominally resolved war in Darfur. On 5 May 2006, the Darfur Peace Agreement was signed, aiming at ending the three-year-long conflict. The Chad–Sudan Conflict (2005–2007) erupted after the Battle of Adré, which led to the declaration of war by Chad. The leaders of Sudan and Chad signed an agreement in Saudi Arabia on 3 May 2007 to stop fighting from the Darfur conflict along their countries' 1,000-kilometre (600 mi) border. The Sudan People's Liberation Army (SPLA) was the primary member of the Eastern Front, a coalition of rebel groups operating in eastern Sudan. After the peace agreement, their place was taken in February 2004 after the merger of the larger Hausa and Beja Congress with the smaller Rashaida Free Lions. A peace agreement between the Sudanese government and the Eastern Front was signed on 14 October 2006, in Asmara. On 9 January 2005, the Nairobi Comprehensive Peace Agreement was signed between the Sudan People's Liberation Movement (SPLM) and the government, with the objective of ending the Second Sudanese Civil War. The United Nations Mission in Sudan (UNMIS) was established under the UN Security Council Resolution 1590 to support its implementation. The peace agreement led to the 2011 referendum which resulted in the secession of South Sudan; the region of Abyei is to hold its own referendum in the future. In February 2003, the Sudan Liberation Movement/Army (SLM/A) and Justice and Equality Movement (JEM) groups in Darfur took up arms, accusing the Sudanese government of oppressing non-Arab Sudanese in favor of Sudanese Arabs, precipitating the War in Darfur. The conflict has since been described as a genocide, and the International Criminal Court (ICC) has issued two arrest warrants for al-Bashir. Arabic-speaking nomads militias known as the Janjaweed have been accused of many atrocities. Before the 2000 presidential election, al-Turabi introduced a bill to reduce the President's powers, prompting al-Bashir to dissolve parliament and declare a state of emergency. When al-Turabi urged a boycott of the President's re-election campaign and signed an agreement with Sudan People's Liberation Army, al-Bashir suspected they were plotting to overthrow him and the government, which resulted in the jailing of Hassan al-Turabi that same year. In the 1996 general election he was the only candidate by law to run for election. Sudan became a single-party state under the National Congress Party (NCP). During the 1990s, Hassan al-Turabi, then Speaker of the National Assembly, reached out to Islamic fundamentalist groups, even personally inviting Osama bin Laden to the country. The United States subsequently listed Sudan as a state sponsor of terrorism. The U.S bombed Sudan in 1998. Later, al-Turabi's influence waned, in favor of more pragmatic leaders who focussed on trying to recover from Sudan's disastrous international isolation. Sudan worked to appease its international critics by expelling members of the Egyptian Islamic Jihad and encouraging bin Laden to leave. In 1976, the Ansars mounted a bloody but unsuccessful coup attempt. In July 1977, President Nimeiry met with Ansar leader Sadiq al-Mahdi, opening the way for reconciliation. Hundreds of political prisoners were released, and in August a general amnesty was announced for all opponents of Nimeiry’s government. Until the early 1970s, Sudan's agricultural output was mostly dedicated to internal consumption. In 1972, the Sudanese government became more pro-Western, and made plans to export food and cash crops. However, commodity prices declined throughout the 1970s causing economic problems for Sudan. At the same time, debt servicing costs, from the money spent mechanizing agriculture, rose. In 1978, the International Monetary Fund (IMF) negotiated a Structural Adjustment Program with the government. This further promoted the mechanized export agriculture sector. This caused great economic problems for the pastoralists of Sudan (See Nuba Peoples). In 1972, the Addis Ababa Agreement led to a cessation of the north-south civil war and a degree of self-rule. This led to ten years hiatus in the civil war. Disputes between Marxist and non-Marxist elements within the ruling military coalition resulted in a briefly successful coup in July 1971, led by the Sudanese Communist Party. Several days later, anti-communist military elements restored Nimeiry to power. Dissatisfaction culminated in a second coup d'état on 25 May 1969. The coup leader, Col. Gaafar Nimeiry, became prime minister, and the new regime abolished parliament and outlawed all political parties. A polling process was carried out resulting in composition of a democratic parliament and Ismail al-Azhari was elected first Prime Minister and led the first modern Sudanese government. 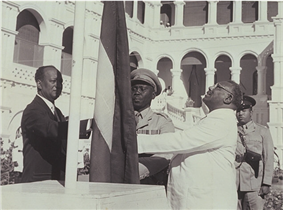 On 1 January 1956, in a special ceremony held at the People's Palace, the Egyptian and British flags were lowered and the new Sudanese flag, composed of green, blue and white stripes, was raised in their place by the prime minister Ismail al-Azhari. The continued British administration of Sudan fueled an increasingly strident nationalist backlash in Egypt, with Egyptian nationalist leaders determined to force Britain to recognise a single independent union of Egypt and Sudan. With the formal end of Ottoman rule in 1914, Hussein Kamel was declared Sultan of Egypt and Sudan, as was his brother and successor Fuad I. They continued their insistence of a single Egyptian-Sudanese state even when the Sultanate was retitled as the Kingdom of Egypt and Sudan, but the British continued to frustrate such reaches for independence. In 1899, Britain and Egypt reached an agreement under which Sudan was run by a governor-general appointed by Egypt with British consent. 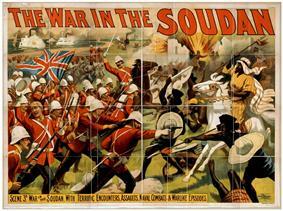 In reality Sudan was effectively administered as a British colony. The British were keen to reverse the process, started under Muhammad Ali Pasha, of uniting the Nile Valley under Egyptian leadership, and sought to frustrate all efforts aimed at further uniting the two countries. Lord Kitchener led military campaigns against the Mahdists from 1896 to 1898. Kitchener's campaigns culminated in a decisive victory in the Battle of Omdurman on 2 September 1898. 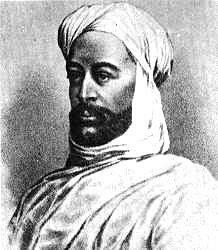 From his announcement of the Mahdiyya in June 1881 until the fall of Khartoum in January 1885, Muhammad Ahmad led a successful military campaign against the Turco-Egyptian government of the Sudan (known as the Turkiyah). Muhammad Ahmad died on 22 June 1885, a mere six months after the conquest of Khartoum. After a power struggle amongst his deputies, Abdallahi ibn Muhammad, with the help primarily of the Baqqara Arabs of western Sudan, overcame the opposition of the others and emerged as unchallenged leader of the Mahdiyah. After consolidating his power, Abdallahi ibn Muhammad assumed the title of Khalifa (successor) of the Mahdi, instituted an administration, and appointed Ansar (who were usually Baqqara) as emirs over each of the several provinces. During the 1870s, European initiatives against the slave trade had an adverse impact on the economy of northern Sudan, precipitating the rise of Mahdist forces. Muhammad Ahmad ibn Abd Allah, the Mahdi (Guided One), offered to the ansars (his followers) and those who surrendered to him a choice between adopting Islam or being killed. The Mahdiyah (Mahdist regime) imposed traditional Sharia Islamic laws. Muhammad Ahmad al-Mahdi ruler of Sudan. The Egyptian authorities made significant improvements to the Sudanese infrastructure (mainly in the north), especially with regard to irrigation and cotton production. In 1879, the Great Powers forced the removal of Ismail and established his son Tewfik I in his place. Tewfik's corruption and mismanagement resulted in the Orabi Revolt, which threatened the Khedive's survival. 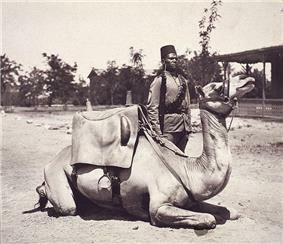 Tewfik appealed for help to the British, who subsequently occupied Egypt in 1882. Sudan was left in the hands of the Khedivial government, and the mismanagement and corruption of its officials. In 1821, the Ottoman ruler of Egypt, Muhammad Ali, had invaded and conquered northern Sudan. Although technically the Wāli of Egypt under the Ottoman Sultan, Muhammad Ali styled himself as Khedive of a virtually independent Egypt. Seeking to add Sudan to his domains, he sent his third son Ismail (not to be confused with Ismail the Magnificent mentioned later) to conquer the country, and subsequently incorporate it into Egypt. This policy was expanded and intensified by Ibrahim's son, Ismail I, under whose reign most of the remainder of modern-day Sudan was conquered. After many attempts at military conquest failed, the Arab commander in Egypt concluded the first in a series of regularly renewed treaties known as al-baqṭ (pactum) with the Nubians that governed relations between the two peoples for more than 678 years. Islam progressed in the area over a long period of time through intermarriage and contacts with Arab merchants and settlers. Additionally, exemption from taxation in regions under Muslim rule were also a powerful incentive for conversion. In 1093, a Muslim prince of Nubian royal blood ascended the throne of Dunqulah as king. The two most important Arab tribes to emerge in Nubia were the Jaali and the Juhayna. 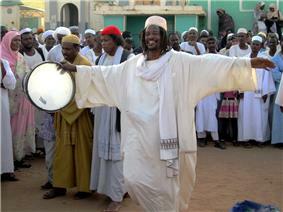 Today's northern Sudanese culture often combines Nubian and Arabic elements. By the 6th century, fifty states had emerged as the political and cultural heirs of the Meroitic Kingdom. Nobatia in the north, also known as Ballanah, had its capital at Faras; the central kingdom, Muqurra (Makuria), was centred at Tungul (Old Dongola), about 13 kilometres (8.1 miles) south of modern Dunqulah; and Alawa (Alodia), in the heartland of old Meroë, which had its capital at Sawba (Soba) (now a suburb of modern-day Khartoum). In all three kingdoms, warrior aristocracies ruled Meroitic populations from royal courts where functionaries bore Greek titles in emulation of the Byzantine court. 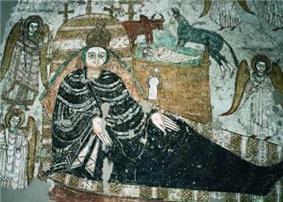 A missionary sent by Byzantine empress Theodora arrived in Nobatia and started preaching Christianity about 540 AD. The Nubian kings became Monophysite Christians. However, Makuria was of the Melkite Christian faith, unlike Nobatia and Alodia. 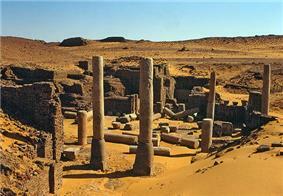 During Classical Antiquity, the Nubian capital was at Meroë. In early Greek geography, the Meroitic kingdom was known as Ethiopia (a term also used earlier by the Assyrians when encountering the Nubians). The civilization of Kush was among the first in the world to use iron smelting technology. 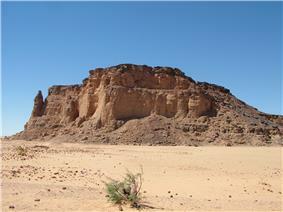 The Nubian kingdom at Meroë persisted until the 4th century AD. 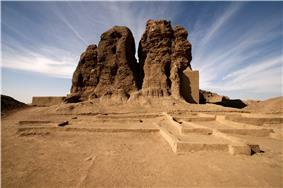 After the collapse of the Kushite empire several states emerged in its former territories, among them Nubia. The war that took place between King Taharqa and the Assyrian King Sennacherib was a decisive event in western history, with the Nubians being defeated in their attempts to gain a foothold in the Near East by Assyria. Sennacherib's successor Esarhaddon went further, and invaded Egypt itself, deposing Taharqa and driving the Nubians from Egypt entirely. Taharqa fled back to his homeland where he died two years later. Egypt became an Assyrian colony; however, king Tantamani, after succeeding Taharqa, made a final determined attempt to regain Egypt. Esarhaddon died while preparing to leave the Assyrian capital of Nineveh in order to eject him. However, his successor Ashurbanipal sent a large army into southern Egypt and routed Tantamani, ending all hopes of a revival of the Nubian Empire. After King Kashta ("the Kushite") invaded Egypt in the 8th century BC, the Kushite kings ruled as Pharaohs of the Twenty-fifth dynasty of Egypt for a century before being defeated and driven out by the Assyrians. At the height of their glory, the Kushites conquered an empire that stretched from what is now known as South Kordofan all the way to the Sinai. King Piye attempted to expand the empire into the Near East, but was thwarted by the Assyrian king Sargon II. The Kingdom of Kush is mentioned in the Bible as having saved the Israelites from the wrath of the Assyrians, although disease among the besiegers was the main reason for the failure to take the city. The Kingdom of Kush was an ancient Nubian state centered on the confluences of the Blue Nile, White Nile and River Atbara. It was established after the Bronze Age collapse and the disintegration of the New Kingdom of Egypt, centered at Napata in its early phase. Anthropological and archaeological research indicate that during the predynastic period Nubia and Nagadan Upper Egypt were ethnically, and culturally nearly identical, and thus, simultaneously evolved systems of pharaonic kingship by 3300 BC. The country's place name Sudan is a name given to a geographic region to the south of the Sahara, stretching from Western to eastern Central Africa. The name derives from the Arabic bilād as-sūdān (بلاد السودان), or "the lands of the Blacks", an expression denoting West Africa and northern-Central Africa. Sudan suffers from several challenges. For much of Sudan's history, the nation has suffered from rampant ethnic strife and has been plagued by internal conflicts including two civil wars and the War in the Darfur region. Sudan suffers from poor human rights most particularly dealing with the issues of ethnic cleansing and slavery in the nation.